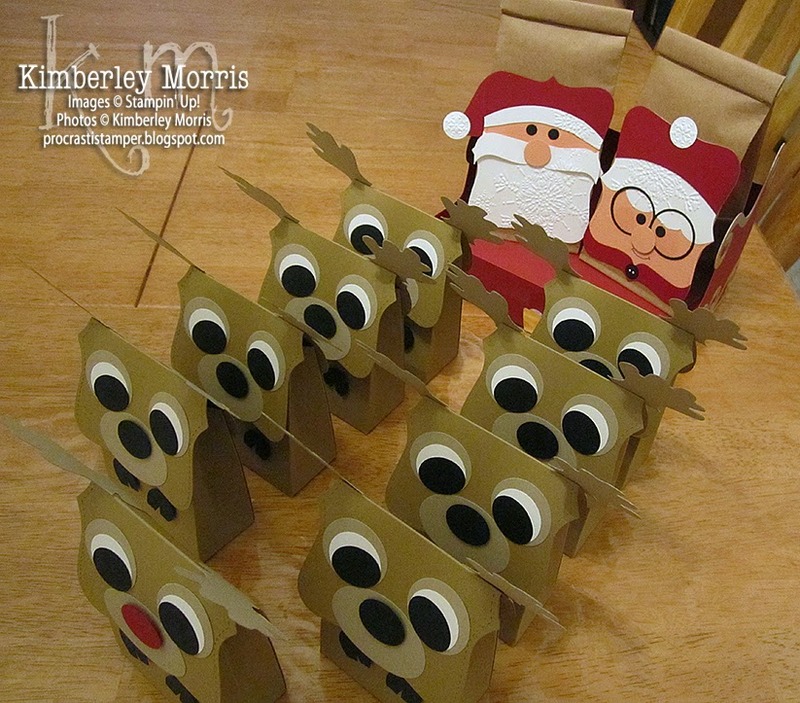 Each of the reindeer is a resealable box, and there are 9 reindeer. Both Santa and Mrs. Claus are resealable bags, so that's 2 more containers. And the sleigh features a resealable box underneath, for a grand total of 12 boxes and bags. The idea is to put a gift in each one, and put one out each day for the 12 Days of Christmas, until the whole ensemble is complete! I know I'm biased, but I happen to think it turned out FABULOUS. My hope was to complete and share instructions for all these several weeks ago, but my computer's operating system pooped itself. I was barely able to get my ecutter working to get the sleigh cut out and get this project mailed out to the buyer who commissioned it, just the other day. And just today I've finally gotten enough back on my computer to edit these photos and post them on my blog. So, I'm sorry that instructions will not be coming anytime soon, but I will share the SVG cut files I edited and used, and the list of Stampin' Supplies, in case you want to wing it. I found a free SVG sleigh file HERE, and modified it for my use on my Eclips2. I created three .scut3 (SCAL/eCAL) files, one with the sleigh and runners all on one 12x12 page, another with just the sleigh parts pushed close together (fits 8-1/2"x11" I think), and a third page with just the sleigh runners, which you could fit on a 6"x12" page. 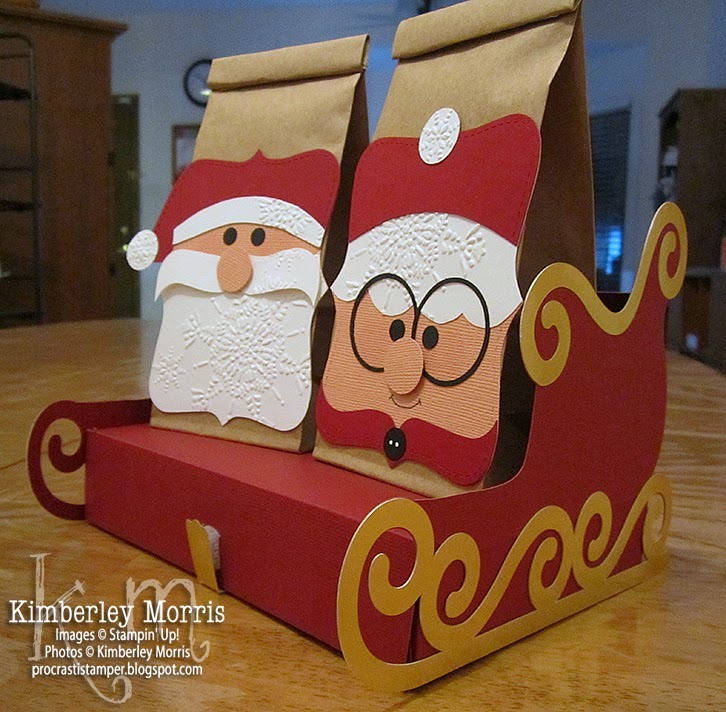 I separated the sleigh and runners so I could conserve card stock. Stampin' Supplies: Baked Brown Sugar card stock, Crumb Cake card stock, Whisper White card stock, Basic Black card stock, Cherry Cobbler card stock (retired Core'dinations used for sleigh), Blush Blossom card stock (retired Core'dinations used for flesh color), Top Note Die, Autumn Accents Bigz Die, Small Oval Punch (black of reindeer eyes, reindeer nose, reindeer paws, and to cut off parts of leaf die cut), 1-3/8" Circle Punch (outside of Mrs. Claus glasses), 1-1/4" Circle Punch (crumb cake layer of reindeer eyes & inside of Mrs. Claus glasses), 1" Circle Punch (white of reindeer eyes & pom poms on hats), 1/2" Circle Punch (Clauses Noses), XL Oval Punch/aka Wide Oval Punch (reindeer muzzle), Owl Builder Punch (Clauses eyes & Mrs. Claus' button), Northern Flurry Embossing Folder, Gold Metallic Foil card stock, Petite Cafe Bags, Basic Black Stampin' Write Marker (for Mrs. Claus' smile), Modern Label Punch (to close box under sleigh), Tombow Multipurpose Glue, Sticky Strip Adhesive, Mini Glue Dots, Stampin' Dimensionals, Pink Pirouette ink pad & Sponge Dauber (optional: to highlight cheeks on the Clauses), White Gel Pen (to put dots on Mrs. Claus' button), and Velcro™ self-adhesive dots for box closures. No, I'm not even near caught up yet, but I wanted to post this card because I remembered to take a picture of it before I sent it off to my daughter for her belated 20th! We love cupcakes, but have never found a cupcake shop with yummy tasting ones that are also organic, with no soy or other ickies. So, we always make our own--but shipping them and having them arrive intact is pretty out of the question. Sending a cupcake card in the mail is the next best thing, right?? Hey, where did I get that little scalloped pennant punch? Actually, I used the bottom part of the cupcake from the Cupcake Builder Punch. I cut from the notch of the first scallop on each side, to the pointy corner closest to it. 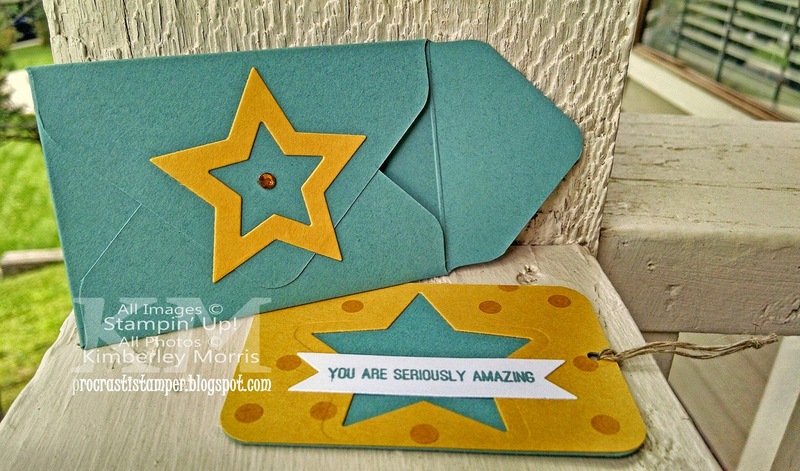 (see illustration below) Super quick and simple, and you can make the card with the same punch that coordinates with the stamp set. Sweeeeeeeeet. 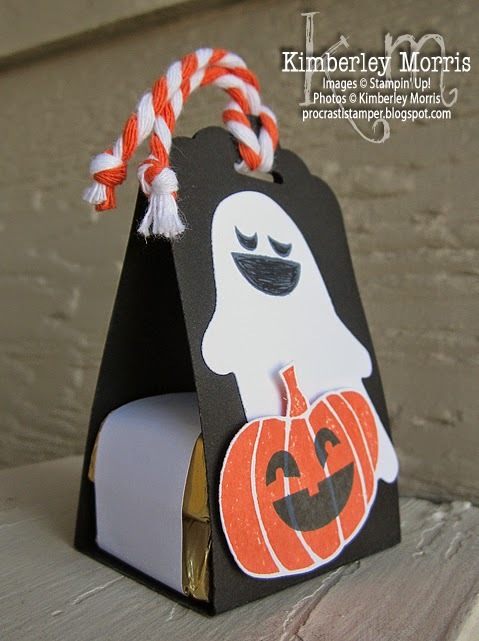 July 2014 Paper Pumpkin + Get 50% Off Your First TWO Months! And below you will see the individual cards we are making! I will try to put together a video in the next couple of days, to run through the prep (including additional product added) and assembly of each item. In the meantime, just know that it's important to do the cards in the order they are numbered in the pictures. 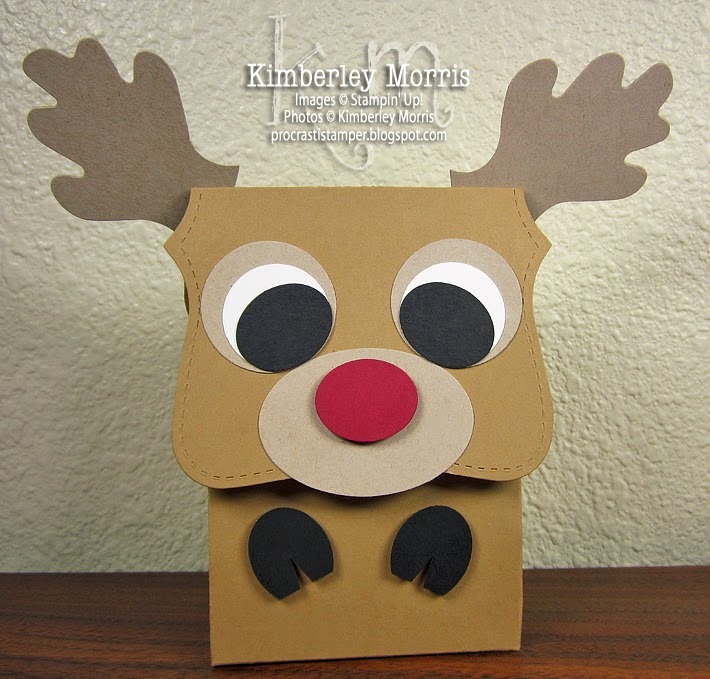 Another hint is that you will want to do the full size envelope flap first, then the full size card, then the mini cards. And finally, don't give yourself an aneurysm trying to find the mini glassine envelopes from Stampin' Up!--those are "contraband" that I've had sitting in my closet for a few years now. The fastest and most accurate way to find out what is available is to check out my Online Store Clearance Rack. I'm a sucker for simple and quick, and with the discounts in the Clearance Rack, you cannot beat the value of KITS and PRE-PRINTED PRODUCT! Stock up before the rush of the holidays, and then just open your cupboard and pick your pretties!!! If you click on any of the following kits and you are not taken to the product page, then it has sold out--I'm sorry! Christmas Banner Simply Created Accessory Kit (this is an add-on to the Build-a-Banner Kit sold in the Annual Catalog), Noel Notes Simply Sent Kit, Pretty Presents Designer Bows, Pretty Presents Designer Tags, Real Red Goodie Gear Simply Created Kit, Season of Sweets Designer Printed Kit, Snow Festival Designer Printed Tags (grab a pack of Crumb Cake Notecards & Envelopes and create greeting cards with these! 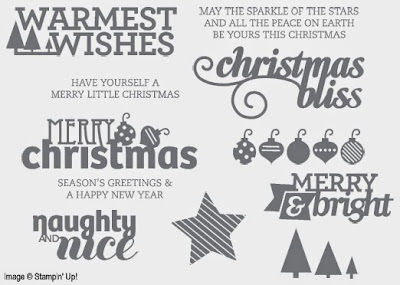 ), Snowflake Season Simply Scrappin' Layout Kit. We also have a holiday photopolymer stamp set called Christmas Bliss that is available--but it's not going to be in the 2014 Holiday Catalog, so if you want it, I suggest you get it NOW! Check these out on this handy PDF. Some items may be carried over again, but the items on the PDF are only guaranteed to be available through August 28th. Another quick share...this is a bookmark made using the 2014-2016 In Colors. The lines under the color name are made with the Stampin' Write marker fine tip, the flower on the left is stamped in the corresponding ink color using a stamp from the Something for Baby stamp set, and the piece on the right is the coordinating card stock punched out with the Itty Bitty Accents Punch Pack. At the top is the Stitched Satin Ribbon in one of the five colors. My customers made these at my New Catalog Open House last month here in Colorado Springs, and they've been going out to my customers with their catalogs. There's nothing like actually seeing real-life samples. If you didn't get one, you can come pick one up at my next Open House on July 11th or 12th. Just RSVP for the session of your choice on my Event Calendar, and follow up with an email to let me know you haven't gotten a bookmark yet. I will also include a PDF of the bookmark below if you want to make your own. Don't forget to print the PDF at 100% size. There are 5 bookmarks on a letter size sheet. Just cut 1/2" from the left and right, and that should leave you five bookmarks that are 2" wide each. 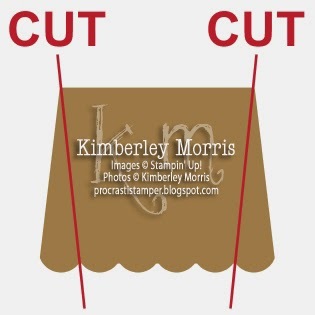 Round the lower corners with the Project Life Corner Rounder, and punch the top with the Scalloped Tag Topper Punch. 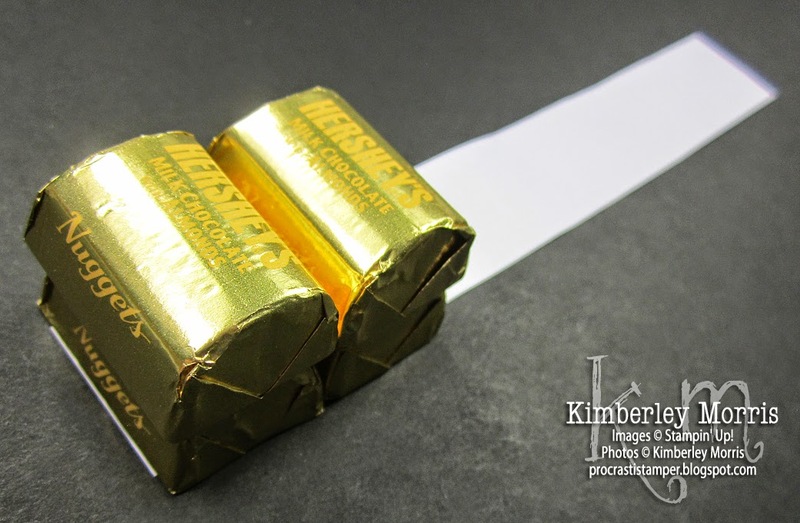 Then cut a length of about 6" of your favorite In Color ribbon and loop through the hole at the top. Just a quick share for you today...a flag card created with the Work of Art stamp set (available in wood-mount or clear-mount). 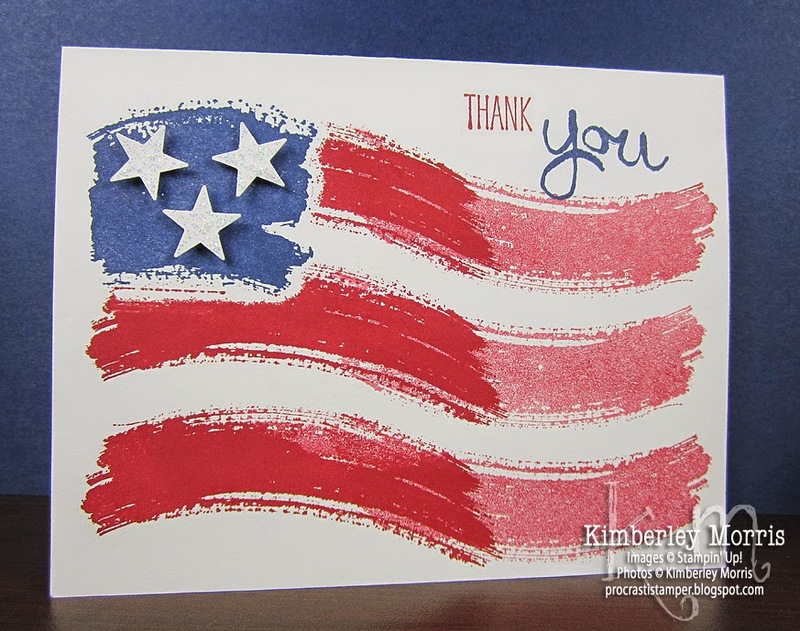 Makes a great thank you card for that BBQ you're going to attend at a friend's place, or an anytime military appreciation card! In addition to the Work of Art stamp set, I also used the star from the Itty Bitty Accents Punch Pack, Night of Navy ink pad, Cherry Cobbler ink pad, Whisper White card stock, and some Dazzling Details on the stars (it's like glitter glue). WANTED: 3 NEW 3-MONTH PAPER PUMPKIN SUBSCRIBERS TO PAMPER! who purchase a three-month or more prepaid subscription no later than JUNE 30th!!! Click HERE for more info on Prepaid Subscriptions! Click HERE to BUY your Prepaid Subscriptions!! 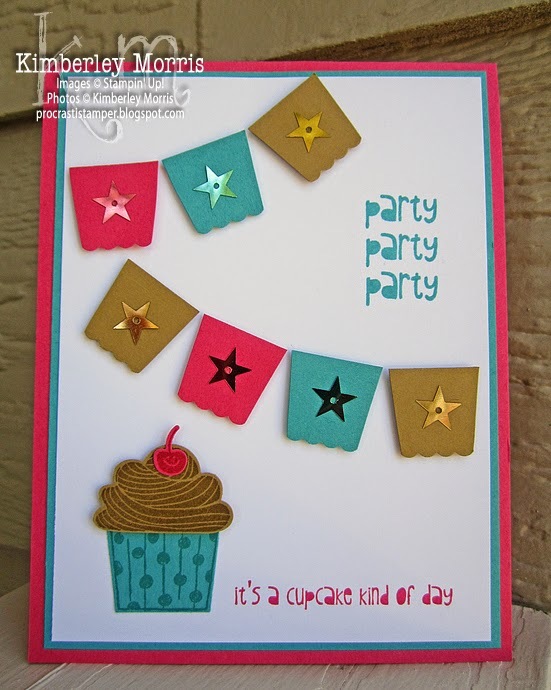 NEW & IMPROVED Paper Pumpkin 2014 - Join the Party June 10th! 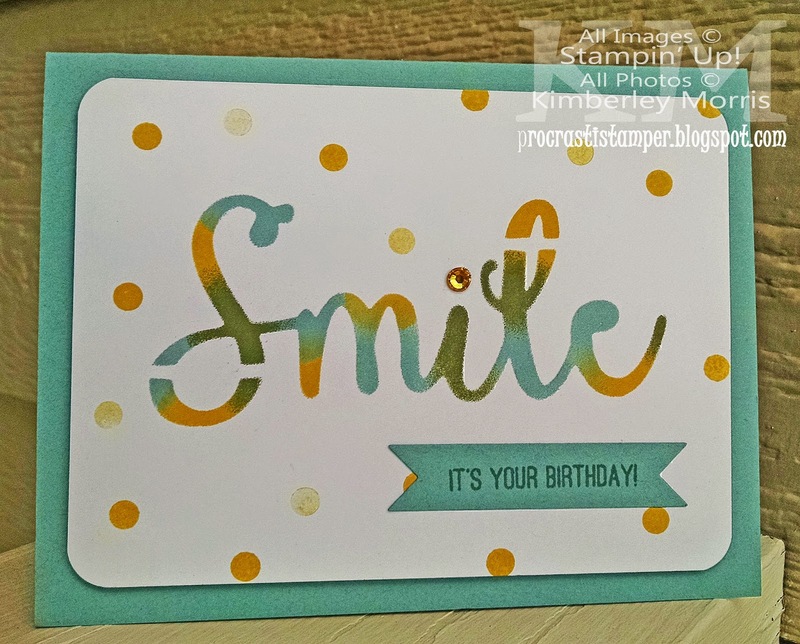 Have you heard of Stampin' Up! 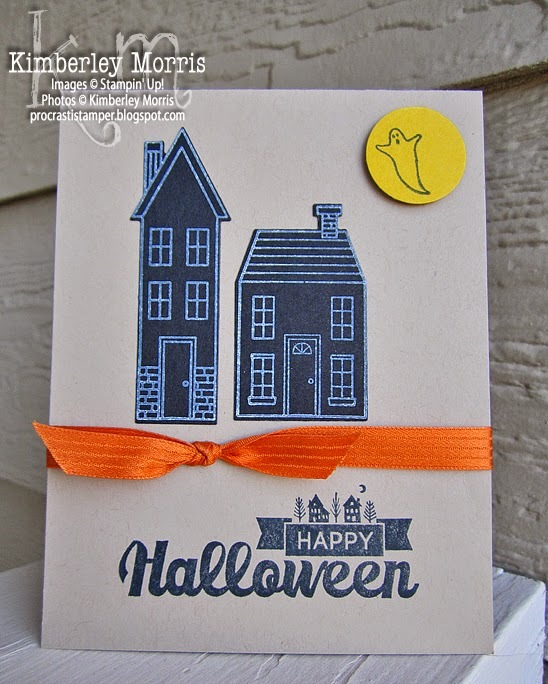 's Paper Pumpkin Kits? If you have, don't tune out yet--the program has gotten a facelift, you can read about it below! 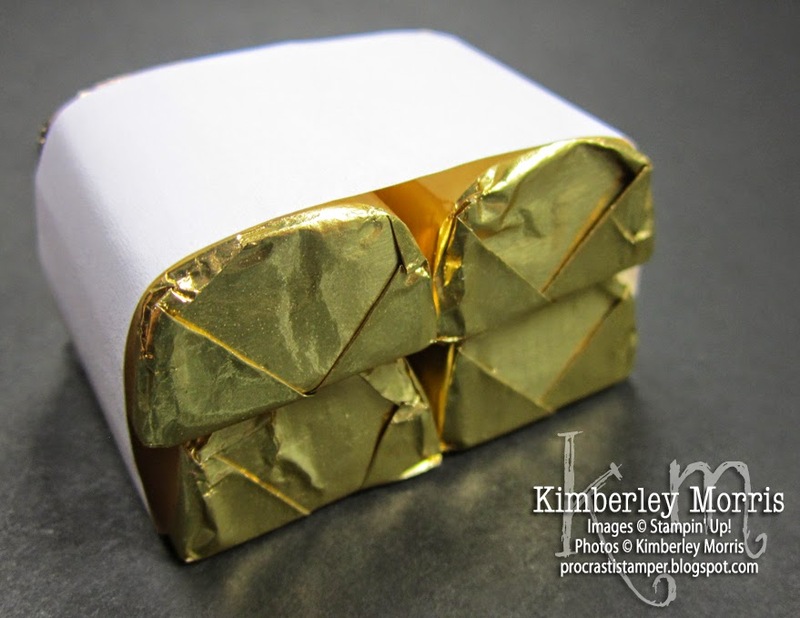 The samples above were created with the May 2014 Paper Pumpkin Kit, and you can check out a YouTube video of the time-lapse unboxing to project completion HERE. The kit included both a Father's Day and a Happy Birthday stamp, for versatility. Get a little more info on the kits, a chance for my customers to win prizes directly from ME (more info later), and a Sneak Peek reveal of the June Kit...with enough time left to sign up and take delivery of the kit this month!!! If you haven't heard of it, Paper Pumpkin has been around for just over a year. It's a paper crafting kit, delivered to your door monthly. It includes stamps, ink, and media to complete a project...for a simple, fast, and fun creative escape (designed to be completed in 30 minutes or less). Most of the bits that need adhering are self-adhesive, but you may need a bit of glue in some cases, and perhaps some scissors. PURCHASE PREPAID SUBSCRIPTIONS! Why would you care about that?? Because you not only get the kits for the same price including shipping, you also get sales credit in the form of Stampin' Rewards in my Online Store, or Hostess Dollars on a Workshop order!!! So, your Paper Pumpkin purchases count towards earning FREE STUFF!!! Give the benefits of Prepaid Subscriptions a try today: click the corresponding link to purchase a 1-Month, 3-Month, 6-Month*, or 12-Month* Prepaid Subscription in my Online Store. You can add anything else from the store that you want, to your Paper Pumpkin Prepaid Subscription purchase! The cost of the kit has NOT changed, it is still $19.95 in the US, and that price includes shipping. 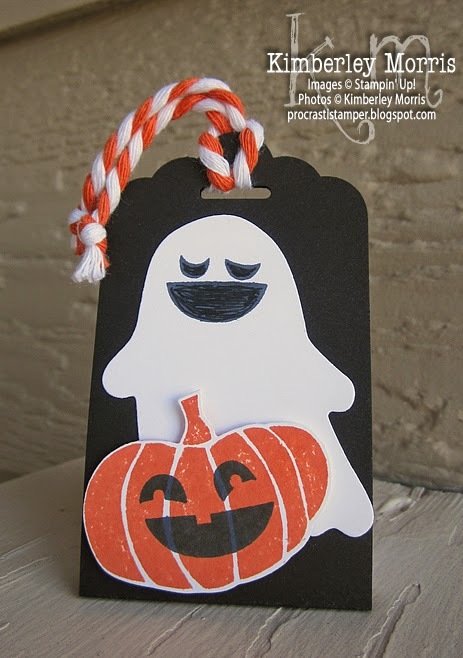 The exclusivity of the stamps has NOT changed--you will only find the Paper Pumpkin stamp images in Paper Pumpkin Kits. The subscription format also has NOT changed, meaning that you can skip any number of shipments you want**, and you are still considered a Paper Pumpkin Subscriber. This means you can Skip the shipments, and still call Stampin' Up! anytime to order any past kits, or past kit refills that become available! *SAVE $1 per kit with 6-Month Prepaid Subscription, SAVE $2 per kit with 12-Month Prepaid Subscription. **Shipments must be marked "Skipped" on your Paper Pumpkin subscription no later than 11:59pm MT on the 10th of any month you'd like to skip.